Used Mazda MX-5 Review - 2005-2015 | What Car? 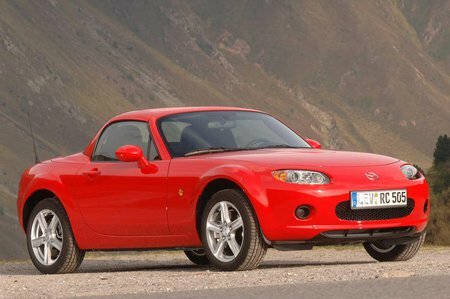 What's the used Mazda MX-5 coupe like? Unlike previous generations of MX-5, this model is available in two different guises: to complement the traditional soft-top roadster, a Coupe Cabriolet was introduced. Its electrically powered folding hard top gives the refinement of a coupe, but allows you to get the wind in your hair at the touch of a button. The MX-5 is one of the best-driving cars available, regardless of budget or badge. Both hard- and soft-top models are impressively agile. The steering is precise and full of feel, while the rear-wheel-drive chassis offers fluid handling with bags of grip. The ride is comfortable and controlled over broken surfaces, especially in the hard-top coupe, which has slightly softer suspension settings. A two-seater sportscar can never be described as practical, but the MX-5 is comfortable and reasonably roomy for two, while the boot provides a good usable space for smaller bags.